Brr, its cold outside! But that’s not stopping the North American river otters at Otter Passage! Home to four North American river otters Clover, Emerald, Larkey and Shamrock, Otter Passage opened in May of 2018. 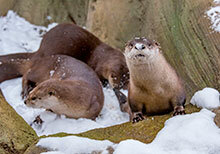 This will be the otters’ first winter at the Milwaukee County Zoo. November brought the first significant snowfall of the season for Milwaukee. Clover, Emerald, Larkey and Shamrock loved playing in their first snowfall! The otters were playing with each other, frolicking and belly sliding down the powdery snow hills. 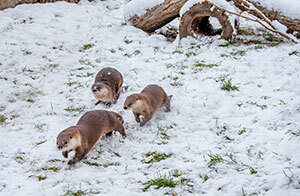 While the otters enjoy playing in the glistening snow, they may need a break to warm-up. Otter Passage features two heated rocks, one near the big pool and another in the artificial hollowed-out tree. Visitors, especially the kids, will love catching an up-close glimpse of the otters snuggling in the artificial hollowed-out tree. North American river otters are acclimated to year-round outdoor temperatures. They have two-layered fur coats, which allow them to stay active, and brave the frosty Wisconsin winters. The outer layer is water-repellent, while the underfur is dense and helps insulate. Even in winter, otters go in the water to search for food by finding openings in the ice or breaking through beaver dams. Create heart-warming memories this holiday season with a trip to the Milwaukee County Zoo. Visitors can see Clover, Emerald, Larkey and Shamrock outside daily depending on extreme weather conditions. If temperatures are below zero or there is a wind-chill reading, the otters will be inside their heated indoor exhibit. Visitors will have snow much fun watching the otters frolic and slide in Otter Passage all winter long! The Milwaukee County Zoo is open 9:30 a.m. to 2:30 p.m. Monday through Friday and 9:30 a.m. to 4:30 p.m. on Saturday and Sunday.